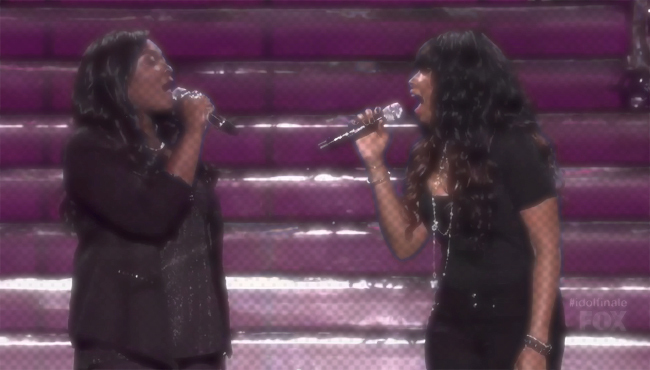 So yeah, the duet with Candice Glover and Jennifer Hudson was good, but did anyone else get the feeling that Hudson was singing over Candice? Of course there were parts where the voices were meant to overlap and harmonise, but there were also sections (2.05) were it looked like Hudson should have been controlling herself, but couldn't resist getting in on the vocal. Also, the way she cut off Candice's note at 1.22 of the video was just damn disrespectful- and that's just when Randy and Mariah were really getting into it. Yes, singers riff off one another, but that didn't seem to be what was happening here. You could clearly see where Candice was sticking to her agreed lines (vocal and lyrical), and how Hudson was just singing whenever the moment took her. That's fine if you're singing with your peers, but it's entirely different when you're trying to support an up and coming novice singer. It effectively made Hudson look like an attention seeking jerk, who was doing her best to overpower and outshine a rival. Candice's body language/ lack of eye contact with Jennifer makes me think she wasn't too happy with the way things were going either. The lack of humility and graciousness from Hudson was a total turn off, especially after watching the way Jessie J handled her duet with the other finalist, Angie Miller. I'm sure I would have enjoyed this performance of Inseparable a whole lot more if I didn't feel sorry for Candice, but, as it is, I'm left with an ugly taste in my mouth that stops me fully appreciating this battle duet. People are so mean. I didn't see anything wrong here. Jen and Candy gave us an GREAT performance. That's the only thing to be said. J-hud also sounded like a foghorn in this performance. I'm almost glad she tried to out-sing Candice because it highlighted Candice's control, dynamics and (comparatively) softer tone. Very unprofessional though. it didn't seem like that for me, i think Jennifer shouldn't have held back, she showed respect for Candice's talent in not doing so. I liked the performance and i felt it highlighted both of their strengths. If Jen was indeed trying to overshadow Candic it would have been in the final note and she didn't. I thought Candice had an effective amount of time to shine and lets not acknowledge the fact that this is a promotional oppurtunity for the artist as well. These talent shows... they just don't anymore... For the last few winners have gone pretty unnoticed to me. Other than Kelly Clarkson, every other real talent from the past decade has come to us through other means than televised talent shows. Candice Glover has displayed remarkable musicality throughout the contest. Having to share half the song and being oversung by Foghorn Hudson didnt really give her much space to work with but she kept it together and showed admirable restraint. Her performance of Youve Changed is leagues beyond anything Kelly Clarkson did during her Idol tenure. Susan Boyle is a perfect example in fact. None of her renditions has contributed anything remotely original, new or even really personal to the world of music. This is the only response you will get from me...go troll someone else. Dearie, you're obviously trolling when you call someone a foghorn. Absolutely agree, in fact Boyle has made her money off the back of the songs she has covered! The only real reason she is successful is because of the media, yes she can sing indeed but she is by far the most talented singer/(songwriter?!? Not) out there lol rant over! lol I think your rant overtook your hand Stuey. Unless you meant that ''she is by far the most talented singer'' sarcastically? J-Hud's voice seems to have become more shrill to me? It also has more of a Macy Gray like quality that I hadn't noticed before, not really a fan of that. I thought this performance was as Diva said J-Hud hogging the spotlight and singing whenever the moment took her. totally agree and sorry to say this but am i the only one who doesn't see candice as a powerhouse vocalist? I called Jennifer Hudson a foghorn for her consistently loud abrasive vocals regardless of the song or the occasion. Thats not trolling that's a defensible perspective "dearie"
Then you can describe it in the way you just did, daahling.